Painted in Mexico City by Luis Juárez, this painting represents the wedding of the Virgin Mary to Saint Joseph. Created in the early 17th century, the painting measures 83 x 57 inches (216 x 145 cm), and is one of two known versions of the scene by Juárez. The iconography of this painting had been developed over centuries and many viewers would have understood the meaning of the symbols in this marriage portrait of Jesus's earthly parents. The high priest of the temple, Zacharias, occupies the central axis of the painting. 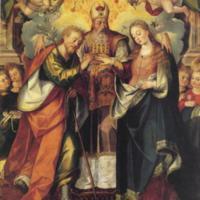 He holds the hands of both Joseph and Mary as they are about to be joined in marriage. The eyes embroidered into his robes are symbols of the omnipresence of God. As if in anticipation of the Trinity that will be created by the birth of Jesus, a dove, symbol of the Holy Spirit, hovers above him. Although God is not visible, his presence—and blessing for this marriage—is implied through the image of his hands, which rest upon the shoulders of the couple, symbolically uniting them. Joseph, conventionally depicted as an older groom, bends towards the Virgin Mary. His outstretched hand offers her a ring and his crooked arm cradles a flowering staff. According to legends of the life of the Virgin, Mary’s many suitors left their staffs overnight in the temple. Joseph’s staff miraculously bloomed, a divine sign that he was to be her husband. The Virgin Mary turns her eyes downward, suggesting her humility. Joseph, the Virgin Mary and the priest stand upon a beautiful carpet whose woven motif of a field of flowers is also one of the many attributes of the Virgin. The robes of the three are also made of finely woven fabrics. Taken together, the elegant textiles in this scene suggest luxury and wealth. Luis Juárez, the painter of this scene, was likely born in New Spain, and his adherence to artistic models from Europe was one reason for his successful career. He created paintings for church retables (retablos) and altars, and was commissioned to make the triumphal arch for the entrance of the new viceroy in Mexico City—one of the most important commissions of ephemeral art of the day. This is an oil-on-canvas painting—one of the most common forms of religious images in Spanish America (and Europe) in the 17th century. The original setting for this painting is not known. In the 20th century, painting seems to have been owned by collectors in France, New York and California before being donated to Davenport Museum of Art (now, Figge Art Museum, Iowa) in 1995. 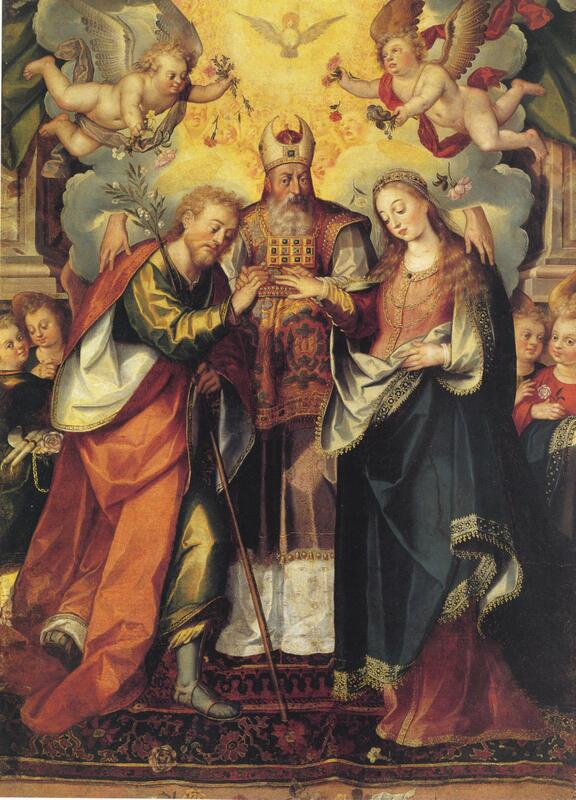 Another version of the Marriage of the Virgin, also by Luis Juárez, was created for the sacristy in the parish church at Atlixco, Puebla (Mexico). The imagery of this painting evokes the Holy Family of Christianity and its lineage on earth. The connotations of lineage are also important for understanding the work of Luis Juaréz, the painter of the scene, who was the patriarch of a well-known dynasty of painters. His son and two great-grandsons number among New Spain’s most renowned painters of religious scenes in the 17th and 18th centuries. While such “dynasties” were hardly uncommon—painters would train their sons and son-in-laws in their workshops, and the most talented would carry on the family trade—the duration and artistic prominence of the Juárez family was remarkable. Burke, Marcus. 1998. Treasures of Mexican Colonial Painting. Davenport: Davenport Museum of Art. Ruiz Gomar, Rogelio. 1987. El pintor Luis Juárez: su vida y su obra. Mexico City: Instituto de Investigaciones, UNAM.